There are places for tourists and places for the locals. In beautiful resort destinations, you’ll be pampered with all the relaxation perks tourism culture wonderfully provides. And then there’s the local life. Where you’re part of the community and you feel like you’re home. It’s those local places that are the best kept secrets. 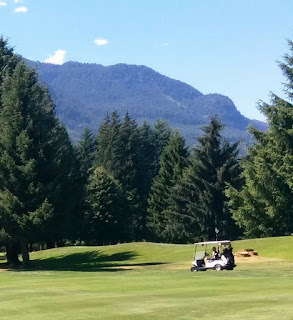 And that’s the golf course I want to share with you: Squamish Valley Golf & Country Club. You won’t feel like a stranger; they’ll make sure of that. 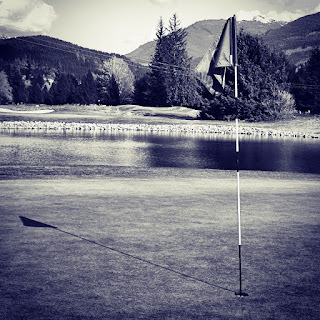 Dan Trevisan is the Head Pro at Squamish Valley Golf & Country Club and he instructs all levels of golf. As a player, Dan also knows what it’s like to win championships. Ya, Dan! I’ve been fortunate to play the course with him and his wife, Dianne. Fun rounds! If you need any golf tips or tweaking, definitely go see Dan The Man (But, don’t call him that. I just made that nickname up while writing this blog post. Or…try it out when you see him and tell him you read it in an article on IVHE. Let me know if he likes it.) Speaking of like, everyone likes Dan! You’ll see what I mean when you meet him. The course is well maintained and groomed with great care and BC pride. Plenty of evergreens and splendid mountain peaks surrounding the 18 holes. Green fees are very reasonable. Psst, keep that a secret! We don’t want them upping their prices. Stay and have dinner. You’ll enjoy the delicious selections on their menu and the spacious patio that overlooks the 9th and 10th holes with its mountain range backdrop. This is the second in a series from our guest blogger, Karen Thrall, Business Coach and Golf Fanatic. Go to IVHE.com golfing properties for more information. Singapore is a 'fine' city. Enjoy the Dolce Vita, we do the rest. Vacation Home Exchange – made easy!